It is well known that fast response is always a desired property for control systems. Overall convergence rates are direct expressions of response speeds. Although overall convergence rates have been researched for a long time, their exact definition was rarely given. Researches on overall convergence rates have appeared for control systems with actuator saturation ; however, it was limited to continuous-time and discrete-time systems . For fast sampling, dynamic responses of a discrete system don’t converge smoothly to its continuous counterparts using shift operator. A relation between regulatable regions and the overall convergence rates has been investigated for DOSs with actuator saturation in . It is difficult to avoid a low convergence rate inherent with a large invariant set . Fast response is an excellent property for DOSs , and convergence rate is related to fast response. In recent years, efforts in different heuristic ways have been made to increase the convergence rate for linear systems under input saturation in [50, 54]. It is important to enlarge the DoA and maximize the convergence rate for DOSs with actuator saturation . 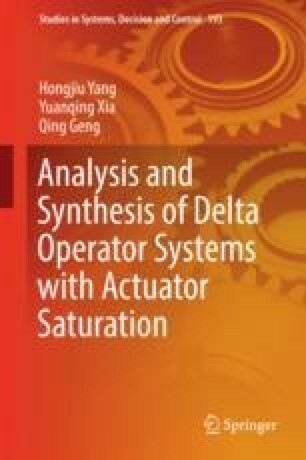 Results on enlarging the DoA and maximizing convergence rate for DOSs with actuator saturation . Moreover, the optimization problem has not been investigated to balance the conflicting objective between the DoA and overall convergence rate in .